Huzzah for the person at American Standard who is our MPS unsung hero of the day! 7 Responses to Oops! Bad Serial Numbers! For you too pee into…what? The tent, where it’s better to be peeing out of than into? Or where it’s better to be peeing into the tent occupied by the current gang of crooks? That must have been either a quietly awesome moment or one where the whole American Standard crew hoisted their beers. Maybe that’s the serial number on all their toilets? I haven’t noticed the serial num on mine. One very happy day at the ceramics plant. I call shennanigans. 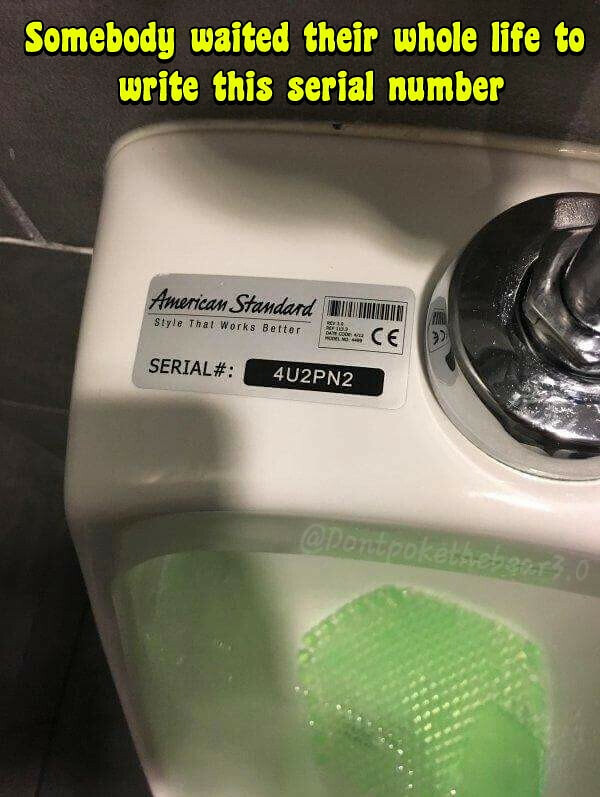 I’ve never seen a serial number tag on the top surface of a urinal–and certainly never one that big.